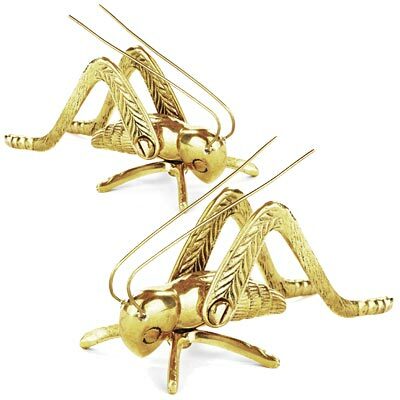 Place two good luck symbols on your fireplace mantle with these Achla Polished Lucky Hearth Crickets. For centuries, crickets have been considered a sign of good luck in China, and one was even featured in Charles Dickens's novella Cricket on the Hearth. These two, adorable brass figures are sure to bring classic charm to your mantle, and their bright, shining finish perfectly reflects light. A crossed base on the underside of each realistic statue provides stability and evokes four legs, while the two back legs each have a high arch and striking detail. Two generous antennae on each unit curve backward, contrasting the downward gaze on the pieces. The brass construction is perfect for use indoors, and the bright yellow finish remains vivid for many seasons. Invite luck into your home with these Polished Lucky Hearth Crickets. Note: This case pack includes 2 of the Achla Lucky Hearth Crickets, Polished.